We are pleased to announce our new Supplier functionality. This includes full support for commission based suppliers. Clients ranging from those with a few consignment items to full consignment businesses can let us do all the complicated tracking! A new Supplier tab is available in the secure web portal. You may add an unlimited number of suppliers and track their full contact information including name, phone number, email address and unlimited length notes. Each supplier has a separate Supplier Account page which shows the current balance, all payments made to the supplier and all products sold that are associated to the supplier. The Product Detail page has been enhanced with the optional Supplier section. Similar to the Modifier Group section, it will only be displayed if at least one supplier has been configured. You may associate a product to one or more suppliers. You can set a commission percent and optionally a date of product acquisition. 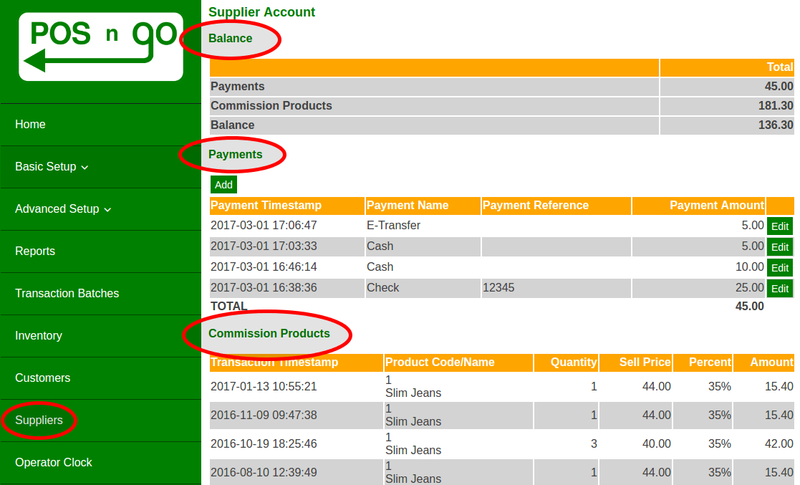 Lastly we have added reports for non-commission supplier inventory, commission supplier inventory and product age. The product age report accepts a cutoff date and will only report on inventory that is older than the date provided.